One of our carpenter crews on site. Did you know that Benton/Linn County SERVPRO has an in house construction company? Well we do! When you chose to have SERVPRO come, and work on your home or business we are able to finish the job completely. You don’t have to worry about finding another company to finish the repairs. Our construction crew is made up of two project managers, three carpenter teams, and a painting crew. They are extremely talented and hard working. Our project mangers work with the insurance company to insure the job is being done to insurance standards, and to what the customer wants. Our mission is to make this situation the easiest we can on the customer, and make sure they are happy with the work that was performed on their home or business. SERVPRO of Benton/Linn County is a company that is more than a company we are a family. The McGinnis family started SERVPRO in 2009 when the recession was in full swing. Tim, Cindy and Nick saw the need for a company that would help those in need, and offer jobs when most companies were laying off workers. SERVPRO of Benton/Linn County employs over 43 people. Our SERVPRO goes above and beyond when it comes to giving back to the community. We want to help! There is no job too small or too big. SERVPRO of Benton/Linn county has responded to 4 active storms across the United States to help those that have suffered at the hand of Mother Nature We will get the job done right, and make our customers happy, because that's why we are here. Conservation can come in many forms. Water is a very important resource to us and we have to be sure to turn off faucets and conserve water when we are able to. Here are some tips for your family and children to follow when it comes to conserving water from SERVPRO of Benton County. When it comes to water conservation, making the matter apparent to your children will have many benefits. It will begin to teach them the value and practices of conservation early on in their lives, a lesson that will hopefully stick for long into the future. Kids are sponges – chances are if you teach your child a way to save water in an interesting way, he or she will relay the message to classmates or friends. Turning off the tap: minimize water use in the shower by turning off the shower head while shampooing and conditioning. Depending on where they live, this practice alone could save the average family up to $100 and 3,200 gallons of water per year (*based on a family of 3). Sometimes you or your kids will pour more water than they wind up drinking. Instead of dumping this water down the drain, use it to water your plants, pour it into your pet’s water bowl, into your teapot or another practical use that will eliminate having to use the faucet. The same goes for ice cubes left at the end of your water glass. Avoiding toys that require a constant stream of water as opposed to those that you fill can make a major difference when it comes to water usage. If it’s just too hot, limiting their time playing in the sprinkler can keep tabs on the situation. 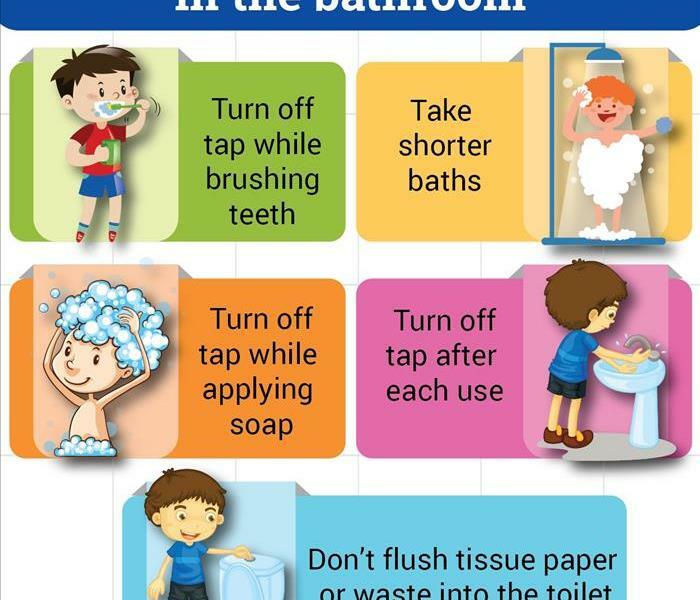 Also reminding your children to not play in the running water faucets and keep water use to just the needed usages. Once you start conserving, expose your children to the struggles for clean water around the world. What they’re doing at home may translate into wanting to do more to help others. The Appliances in your home that can cause water damage ! Water damage can happen from many different appliances in your home. Here are some tips from SERVPRO of Benton County on how to make sure your appliances are working properly and the water supply lines are in good condition. As a good rule of thumb, check behind your appliances once per year. This is a good way to address problems before they happen. Small leaks stemming from a washing machine may appear to be a minor issue, but the problem should not be ignored. Even a pinhole leak in a water supply line can subsequently break out into a household flood. In fact, a burst supply line is a key cause of significant water damage involving washers. A good way to prevent water damage is to check your hoses leading to your washing machine a couple times per year. Also consider installing an automatic shutoff valve. When water pools on the floor, the sensor detects it and closes the water valve. We appreciate the convenience of an automatic ice maker, but it can also be the culprit of household floods. The copper or plastic water line that supplies an ice maker can leak or worse yet, become unattached if it’s not installed properly. Again, you should inspect the line periodically for crimps and make sure the valve connection is secure. Leaving a four inch gap between the refrigerator and wall also helps to prevent crimping in your water line. Dishwashers are another common appliance that can cause problems. If a dishwasher has a supply line burst it can fill your kitchen with water during a wash and rinse cycle. 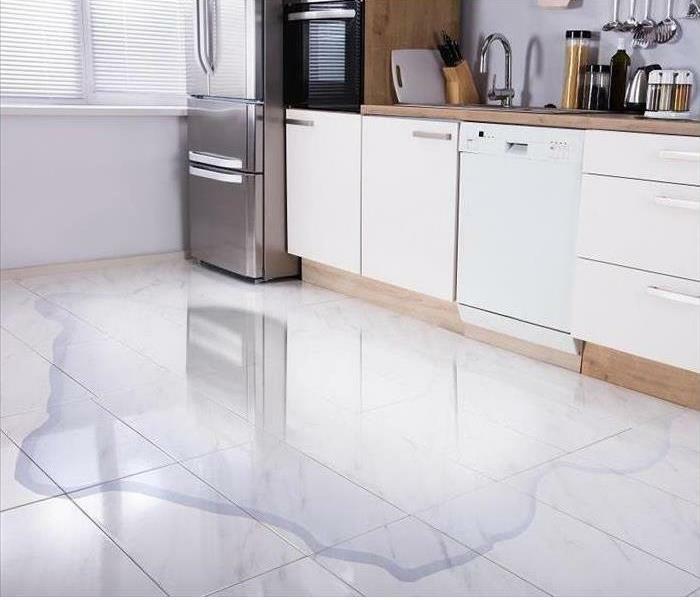 Another source of household floods is when a dishwasher backs up soaking the floor with sudsy water. The problem could be the wrong detergent, a faulty float, the buildup of food and other debris in the drain gate or a clog in the discharge hose under the sink. Routine inspection of the hoses and connections can save you major repair costs in the future. In addition, check the drain gate frequently and remove food particles and debris. Your house is damaged by water…….What do you do? Water can be extremely damaging to your home. It is vital to act quickly, before more damage occurs. First you must stop the water source or intrusion. 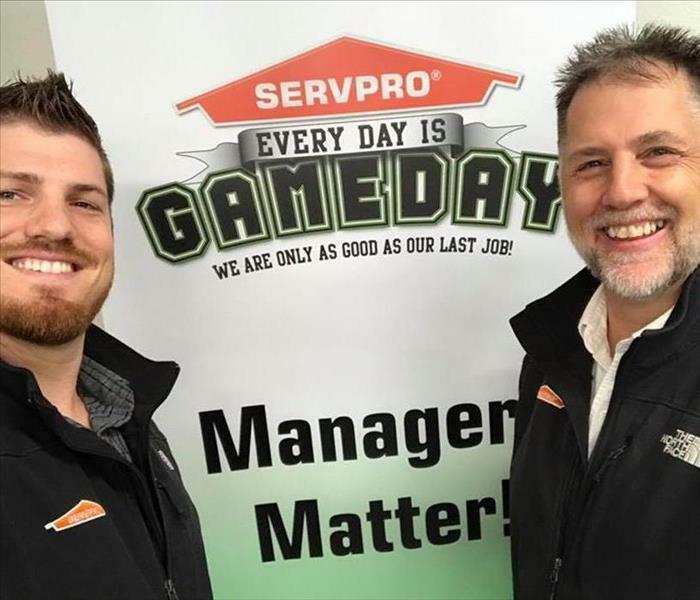 Once stopped, mitigating, or keeping more damage from happening, is where service professionals like SERVPRO of Benton County. SERVPRO can come out to your house, assess the damage, clean and dry the area affected, and restored. 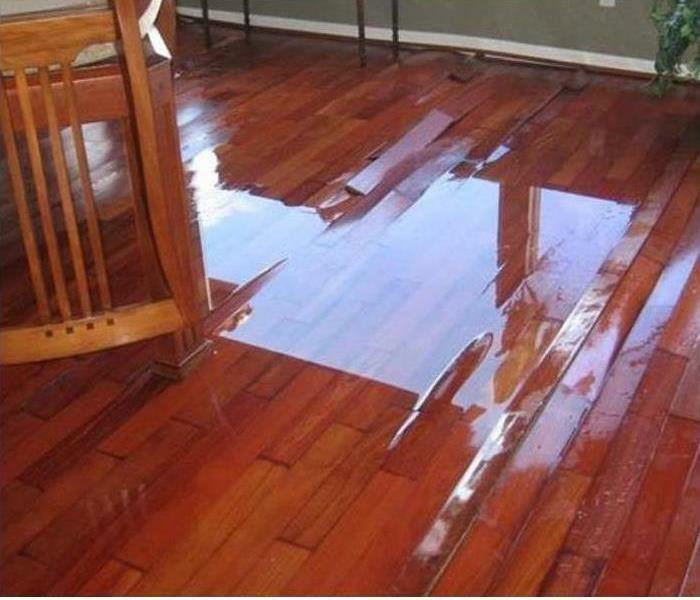 Professionals, like SERVPRO of Benton County can identify water damage in obvious areas, classify the type of water doing the damage, and put together a plan of action to mitigate and restore the affected area. 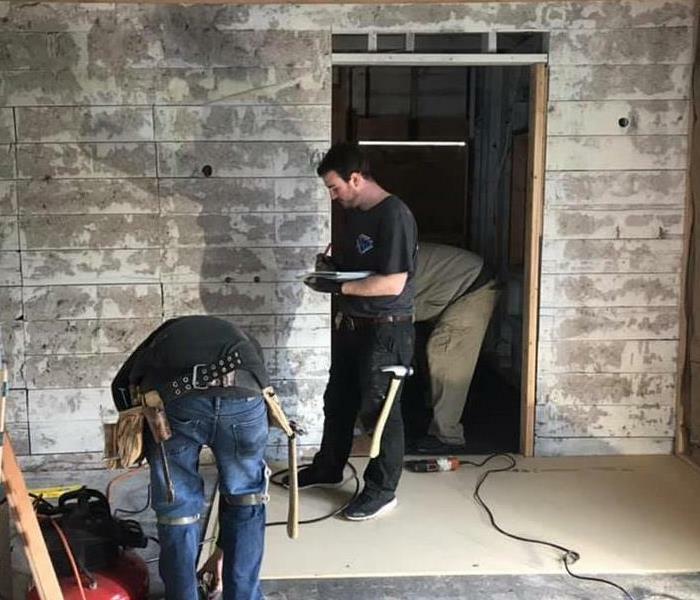 In addition, restoration professionals find areas unseen that have been affected and create access, or use professionally designed equipment, that allows the drying and restoration process to occur. Whatever type of water damage you may have, whether it is a clean water break, a leaking washing machine, or a sewage leak, it is still very important to address it quickly before further damage occurs. SERVPRO is equipped to handle whatever the situation, whether large or small. Permanent damage happens quickly, from wood surfaces deteriorating, carpet de-laminating, or mold beginning to appear because of the moist conditions. This is why it is so important to act quickly. Remove any newspapers, magazines or colored material that may bleed onto carpets. Remove to a safe, dry place any paintings, art objects, computers, documents and other materials that are valuable or sensitive to moisture. .
To prevent future water damage it’s a good idea to make sure that you regularly maintain your plumbing and roofing. In your bathroom and other rooms you should make certain that you have good ventilation and you should use good insulation in your windows and walls – especially your basement. Make sure as well to clean your gutters regularly and to make sure that there is no overspill. If you are buying a new home, make sure to research the area first to avoid houses on flood plains. You can also prepare for potential water damage by making sure you keep your most important belongings up high and away from basement level. You should also make sure you have the number of a 24-hour emergency water damage restoration service, like SERVPRO of Benton County, in your phone at all times and you should have good insurance coverage for your home and for your possessions to cover the restoration services and items that needs may need replacing. Be ready in case of emergency, but if and when one occurs, rely on the professionals at SERVPRO of Benton County. How we handle fires at SERVPRO. This is a before picture of a fire job Benton SERVPRO worked on. Typically, we are called out at all times of the day and night. We do get some who come in the door and referrals from the people we've worked with. Usually fires have a pretty short timeline. We're first call responders. We get the fire alerts and then one of us will go out to the fire and just let the customers know that we're there to be of assistance. We get out of the way of the professionals and will hang out and give the property owner any assistance we can. We can help them get the insurance process started by calling their agent for them while they take care of their family. A lot of the time we will send pictures to the insurance agent and help the customer communicate with their insurance agent. In the off-hours the customer has no way to contact their insurance agent, but we have most of their cell numbers, so we can text their agent and let them know about the incident. The agent appreciates it and the customers do too. Every now and then, an agent, an adjuster or a customer will call us on a fire, but that's less common than us going out and actually seeing the fire right after it happens. The other work we do is with water damage, mold, and bio-hazard. It comes to us through referrals, our corporate office and through good people who know us or see us through our advertising. If you have a fire in your home SERVPRO can help you with so much more than just the restoration process. Let SERVPRO of Benton County take care of you in your time of need. 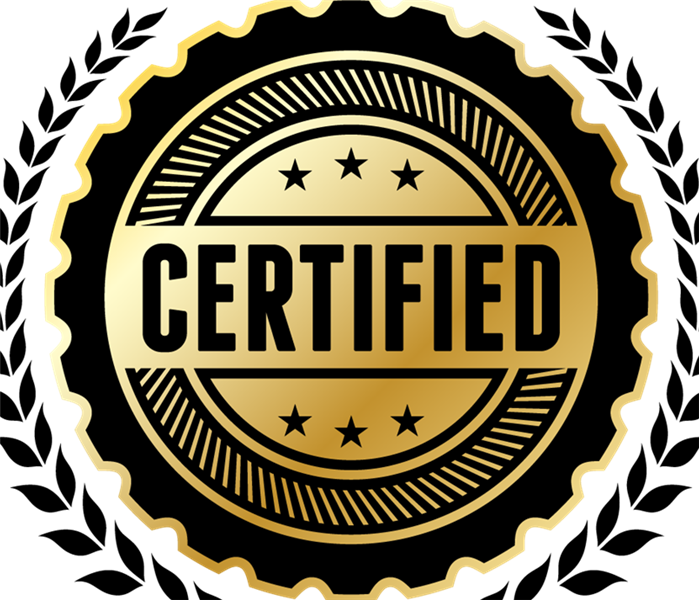 Why SERVPRO, because we are certified. Why SERVPRO of Benton County? SERVPRO of Benton County is a company that strongly believes in giving back to the community. SERVPRO of Benton County is involved in many charitable events during the year. SERVPRO of Benton County staff goes above and beyond to give back. Just recently we participated in two fundraisers back to back in one day. These organizations mean so much to our SERVPRO family. 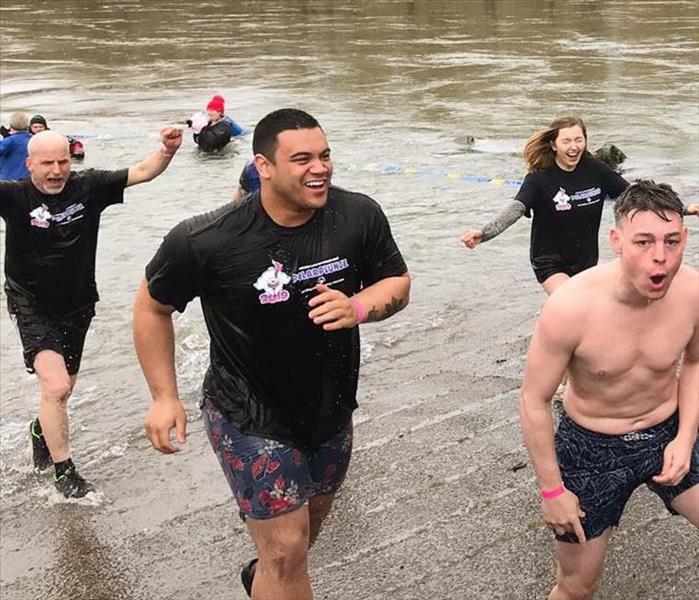 On February 16th, 2019, SERVPRO of Benton County participated in the Polar Plunge for the Special Olympics which benefits our local Special Olympic athletes, and the Run Off Your Tutu for Furniture Share which helps local in-need families with beds and furniture. Both of these organizations impact our community greatly. SERVPRO of Benton County's mission is to give back whenever we can. That’s why when you're looking for a company to work on your home or business for your restoration needs, SERVPRO of Benton County is the one to pick, because we care for our community. What are the most common cause of a fire? While there are many reasons why a fire can start, many business fires start as a result of not paying attention to many different fire hazards in the workplace. While every workplace is different, there are some common fire hazards to watch for in your business. Hot machinery and heavy equipment can pose a fire risk. Be sure material that is combustible is kept away from sources of heat and are unplugged when not in use. Never leave equipment on overnight. Fires caused by faulty equipment are the most common type in the workplace. Be sure to look out for loose or damaged wires. They need to be replaced immediately. Also keep your equipment checked and up to date. Be sure to check fire alarm systems and equipment often to make sure they are still in working order. If batteries run out your fire alarms will not sound in the case of a fire or smoke. It is important to make sure you have functional fire alarms in your office. 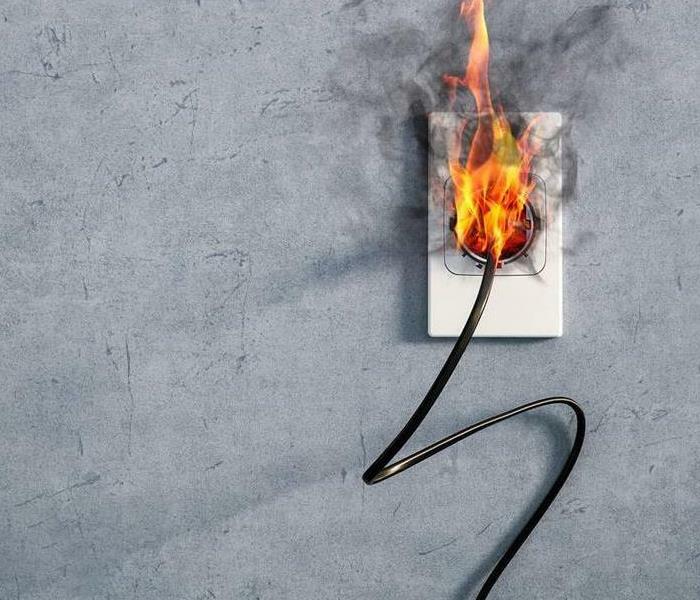 Having too many things plugged in the same socket can be dangerous. Be sure to put one plug per socket and do not exceeds 300 watts in the entire socket. This can reduce the risk of a fire in your workplace. SERVPRO of Benton County is here to help 24/7 if you home, or workplace experiences a fire. 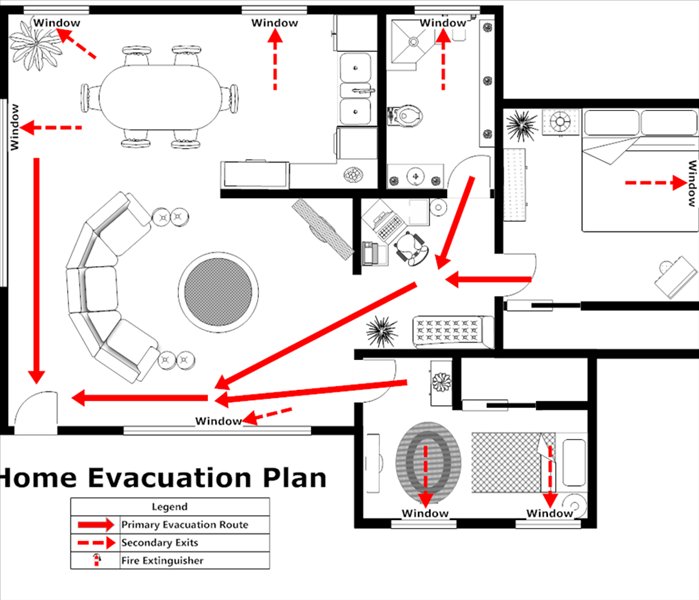 Do you have a emergency fire plan for your home? We are all busy with kids, school, work, after school activities, but we all need to take some time out of our busy schedule, and make a family fire plan. I know as a parent it hard to juggle family life, but safety for my family is always on my mind. Here is what you can do. Make a map of your home, and make a fire exit plan. Post you fire plan in the kitchen area a daily reminder. Conduct drills like listening for the smoke detector, and practicing the fire exit plan for evacuation. Talk about fire safety with your children. Play games to teach them stop drop and roll, and to be ready for if a fire if it happened in your home. If a fire happens in your home SERVPRO of Benton County can help you fix your home. We are here for you and your home 24/7. 4/17/2019 - SERVPRO can start and Finish the job. 4/17/2019 - We want to help! 3/28/2019 - The Appliances in your home that can cause water damage ! 3/15/2019 - Your house is damaged by water…….What do you do? 3/6/2019 - How we handle fires at SERVPRO. 3/4/2019 - Why SERVPRO, because we are certified. 2/25/2019 - Why SERVPRO of Benton County? 2/19/2019 - What are the most common cause of a fire? 2/18/2019 - Do you have a emergency fire plan for your home?